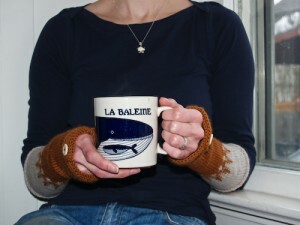 If you’ve read this blog for any length of time, you know what July means: the Tour de France and its celebratory knit-along! 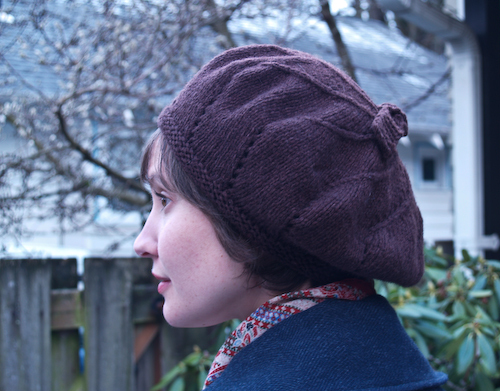 I already know I’m going to fail at completing this year’s epic project (on which more later), so I thought I’d at least kick things off with a little bonbon… after all, it’s been a while since there was a new free pattern up here, ne c’est pas? 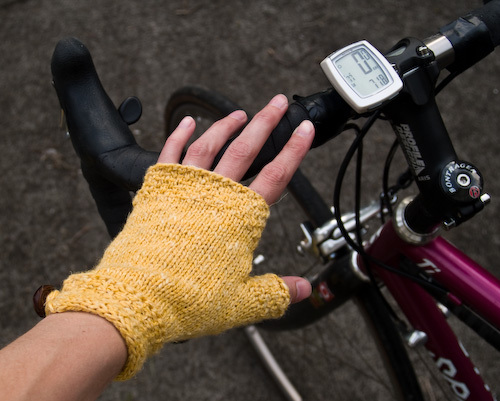 How about a simple pair of fingerless gloves inspired by cycling wear, with just a few classy details? 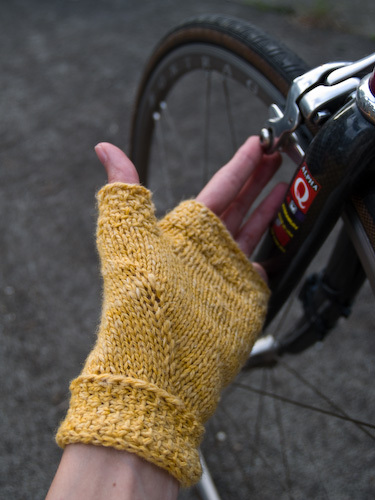 I’m calling these the Vilaine Gloves in honor of the river the peloton will cross on their way into the finish town of Redon tomorrow. 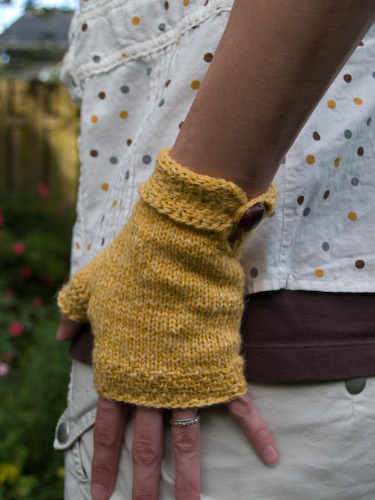 I knit them using far less than one skein of The Fibre Company’s Savannah DK, a summery blend of wool, cotton, linen and soy, but the pattern is written with length and percentage measurements so that you can use a yarn of any weight from your stash. More pictures? Glad to oblige. 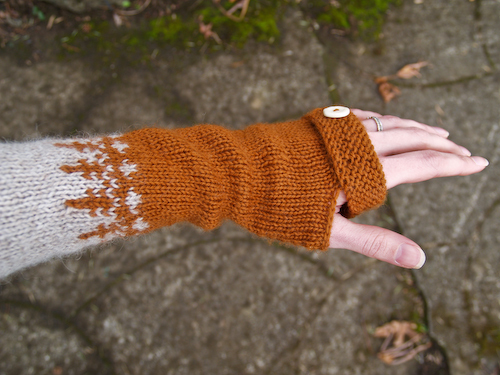 I used one of my favorite thumb gussets, placing the increases only on the palm side. This treatment is most useful if there’s patterning on the back of the hand you don’t want to disturb, but I like the way it looks in general. Final point of polish: a professorial leather button to close the wrist band. 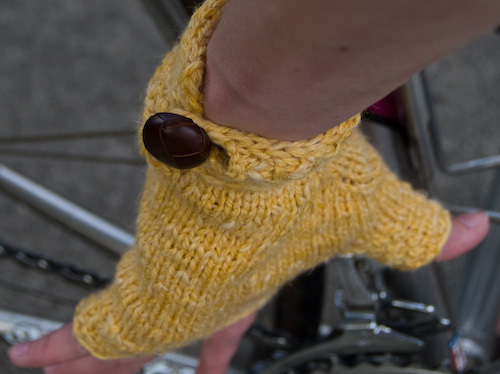 One needn’t, of course, wear these gloves for actual cycling, so you can choose as dressy a button as you wish. As always, please contact me right away if you find errors or tricky bits in this pattern. 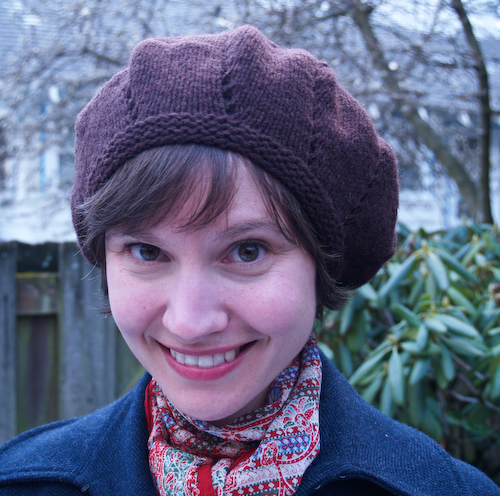 Full disclosure: I knit and wrote this sucker in the space of two days. During the first, the yahoos up the hill who can’t wait until 4 July to light their illegal fireworks panicked my poor dog, who jumped or squeezed under the fence and went on the lam for a night and a day, causing anxiety and heartbreak in all quarters. (Thanks to all that is good in the universe, she was not run over on Sandy Boulevard and kind souls Jean and Tim coaxed her into their home and reported her so I could retrieve her the next afternoon. She is terribly footsore but safely home.) Then last night the baby decided to conduct a one-girl circus in our bed for several hours. All this is by way of saying there are probably errors, so knit with sense and trust your judgment, mes amis. We rescued this hat from the sad fate of abandonment on a sidewalk during a week of solid rain — we let it sit for a few hours after we first saw it in case the owners were backtracking for it, but it was only getting more and more sodden and forlorn. I hope we’ll run into another young family in the neighborhood who will say, “Oh, we had that same hat, but we lost it!” and I’ll be able to give it back. Meanwhile, it’s having a happy second life warming my big girl’s big head. 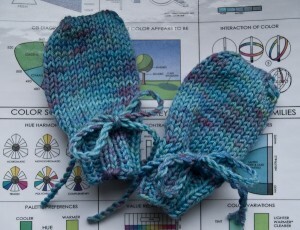 Want an easy-peasy thumbless mitten recipe for a baby in your life? Here you go! CO 28 sts and work 9 rounds in k2, p2 rib. 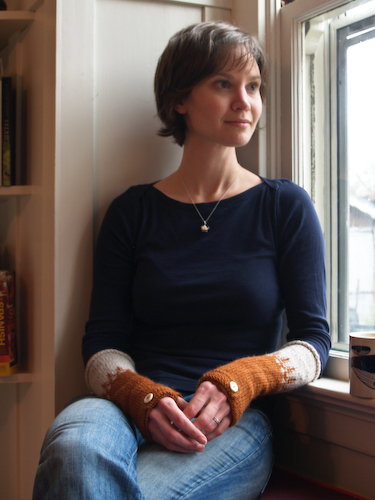 On the 10th round, knit the knits and yo & p2tog over all purl sts but the last two. Knit 20 rounds, then decrease as given below. Rounds begin just left of center on the back of the mitt. Rnd 1: K3, k2tog, k2, ssk, k8, k2tog, k2, ssk, k5. Rnd 2: K2, k2tog, k2, ssk, k6, k2tog, k2, ssk, k4. Rnd 3: K1, k2tog, k2, ssk, k4, k2tog, k1 and then divide the sts on two needles, one for the palm and one for the back of the mitt, to graft them closed. There will be one extra st on the back where you didn’t work that 4th dec; simply work those 2 sts tog as you graft. 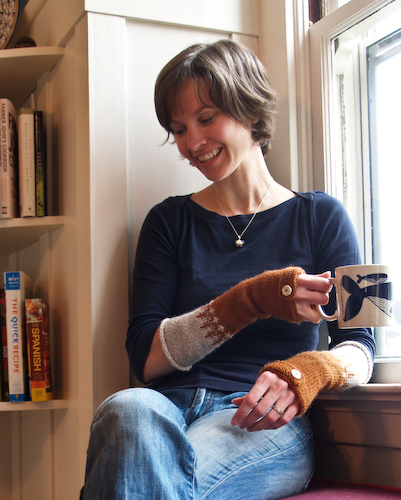 Twist up a mitten cord, beginning with a length of yarn about as long as your wingspan, tying a knot in the middle and looping it over a wee doorknob or picture hook or the finger of an obliging friend, then twisting the two ends together until they do not wish to twist any more. Keeping tension on the cord, pinch it at the mid point and at the ends, then relax the tension and let it twizzle up into a lovely cord of a good length for weaving in, out, in, out through the holes above the cuff and tying in a bow. Tie a knot in the end that needs it before you do any weaving, of course. If your cord has squirrelly bits that twizzled away from the main cord, just give a few tugs on the ends and they should jump back into place. 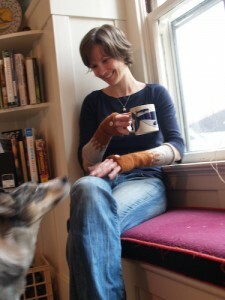 Make another cord for the second mitt. I’m going to pick up stitches on the inside of the cuff tops and knit a lining for each mitt for extra warmth, but for now Ada’s wearing them over those sleeves that fold over her hands. P.S. 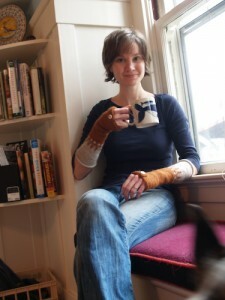 Someone’s going to ask about Ada’s furry boots. They’re made by Robeez and I love them. I justified the splurge by giving them to Mr. G as a birthday present, but they’ve been well worth it; they are as functional as they are cute. 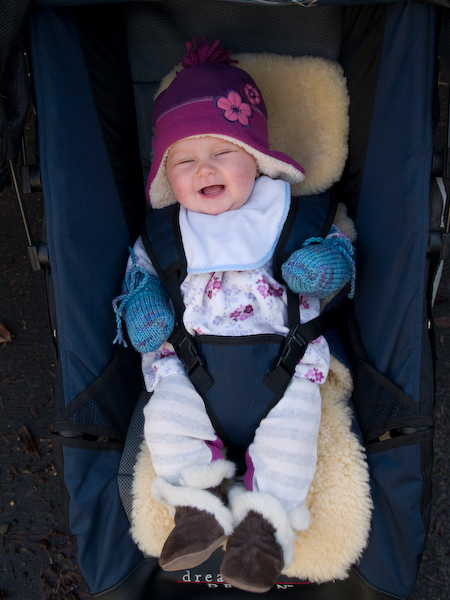 And luckily Ada has very small feet, so they should last all winter. New version of the pattern added 19 February 2010. The wool I used is a soft 2-ply Columbia wool from Oregon’s Imperial Stock Ranch; you could substitute any worsted weight wool, but a fuzzy woolen-spun will give you a cohesive, warm fabric. The slouchy beret is worked on needles slightly smaller than recommended for extra structure and a felt-like hand. 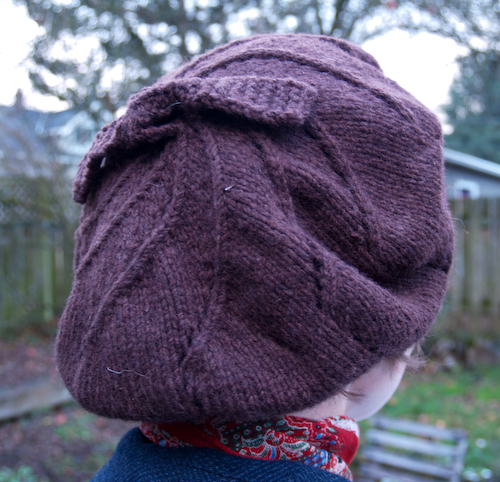 Lines of yarnover eyelets swirl decoratively up to a knit-on garter-stitch topper. The Columbia wool will full quite readily if you wish to tailor the fit after knitting.